I got lucky and picked up Cranberry Grapefruit at a local grocery store that happens to carry a nice variety of Village Candles. It’s always fun (and preferable) smelling a fragrance prior to purchasing it and this one smelled nice and fruity – a perfect scent for spring. Our Cranberry Grapefruit pairing brings a juicy spark to any setting. Energizing in nature, this colorful fragrance brings a welcome feeling of exhilaration and a fresh approach to every day. That description doesn’t tell you much, but that’s okay. Smelling the wax, I picked up on an equal measure of both cranberry and grapefruit so that’s a good sign. The best part, one element didn’t dominate over the other. It wasn’t super zesty or sharp, nor too sweet or tart. It was a perfect balance of the two. I liked it just based off cold sniff. Now let’s see how it performs once burning! I lit this candle in my guest bedroom (a medium size room) and am happy to report, it did quite well there. Once the wicks were lit, a full melt pool formed in no time (thanks to two wicks) and from then on out, a balanced aroma of zesty grapefruit and cranberry filled the room. Up close to the candle, the grapefruit did stand out a little more but you would never know once you move away from the candle. All I could smell was a sort of grapefruit and cranberry spritzer. 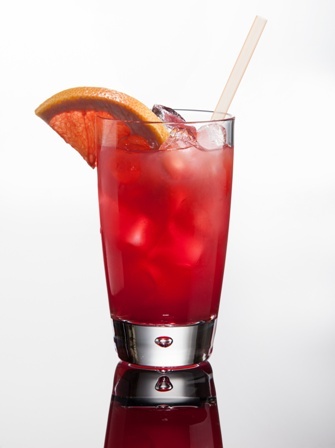 Strength – I would rate Cranberry Grapefruit an 8 out of 10 in a really large room. That’s not bad at all. 10 in medium to smaller rooms. This candle burned great. Very little wick maintenance too which I loved. Clean burning from beginning to end. 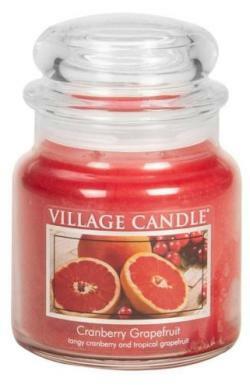 I enjoyed Cranberry Grapefruit from Village Candle and would totally purchase this one again. The aroma smelled like a grapefruit spritzer with a shot of cranberry. Totally my kind of scent and a perfect fragrance for spring/summer. I hit a great sale with Village a couple of weeks ago and bought a few of their newer scents to review so stay tuned. 🙂 More reviews to come.